Publics around the world overwhelmingly agree that the news media should be unbiased in their coverage of political issues, according to a new Pew Research Center survey of 38 countries. Yet, when asked how their news media are doing on reporting different political issues fairly, people are far more mixed in their sentiments, with many saying their media do not deliver. And, in many countries, there are sharp political differences in views of the media with the largest gap among Americans. To build off Pew Research Center?s earlier findings about U.S. news media habits and attitudes, this new cross-national survey begins to study these dynamics globally. 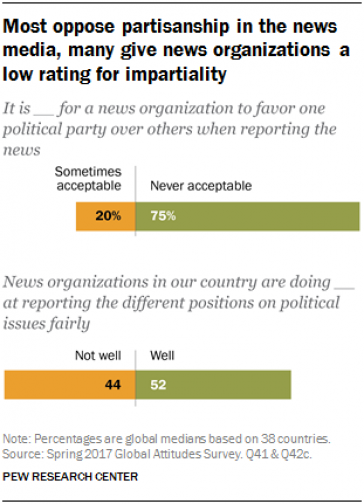 The survey finds that a median of 75% across 38 countries say it is never acceptable for a news organization to favor one political party over others when reporting the news. Just 20% say this is sometimes okay. People in Europe show the greatest opposition to political bias in their news, including 89% in Spain and 88% in Greece who think this is unacceptable. In the United States, 78% say the news media should never favor one political party over another. In only five countries do at least three-in-ten believe it is okay to favor one side. For more info ... please click the ( Pew Research ) previous Hat/Tip link.